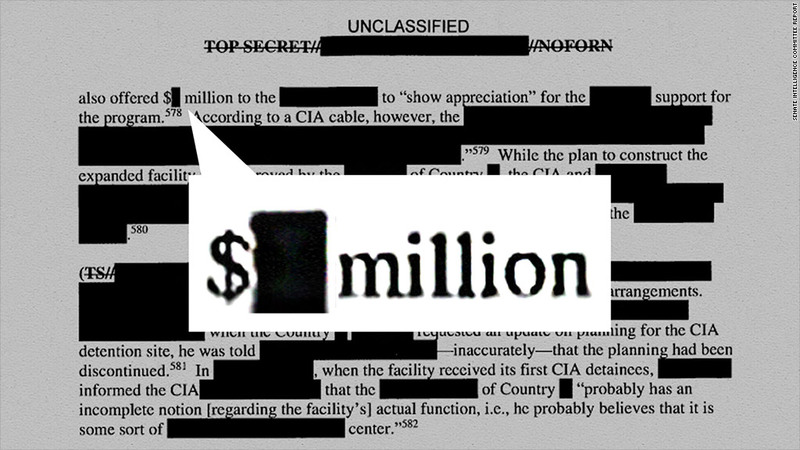 More than two dozen dollar figures were redacted from the 500-page Senate report on the CIA's post-9/11 interrogation program. The CIA spent "well over" $300 million on the CIA's covert detention and interrogation program, according to the blockbuster Senate report made public Tuesday. What exactly did that money buy? The report offers some answers -- and hides others. A relatively quick scan of the report found more than two dozen instances in which dollar figures were covered over by a thick black bar or omitted entirely. The money funded an elaborate operation including the detention centers themselves. Additional cash -- sometimes called "subsidies" -- was used to "show appreciation" to host countries that housed the jails. But many specifics, such as the names of countries and precise costs, are redacted from the grisly report. For example, the report says the CIA was offering millions in subsidies to at least three countries that agreed to host detention centers. In one set of documents, CIA headquarters asks a local CIA office in an undisclosed country to "advise if additional funds may be needed to keep [the facility] viable over the coming year and beyond." Headquarters continued, "We cannot have enough blacksite hosts, and we are loathe to let one we have slip away." That country may have slipped away, however. The report says it "never hosted CIA detainees." In another case, CIA headquarters made a million-plus dollar offer to a potential host country. That figure was apparently too high for the liking of the local CIA station chief, who told his superiors: "Do you realize you can buy [Country redacted] for $[redacted]?" One of the details provided is that the CIA spent $200,000 for a detention center built in 2002. The report does not identify the location, but says it was identified internally by the name COBALT and "was not a place for the use of [enhanced interrogation techniques]," but a was waypoint for detainees headed to "DETENTION SITE GREEN." The $300 million price tag does not include personnel costs, but it does include "two facilities costing nearly $[redacted] million that were never used, in part due to host country political concerns." The lack of details is "unsurprising," said Steven Aftergood, an advocate for government disclosure and program director at the Federation of American Scientists. "The intelligence community makes a point of not disclosing the cost figures as a routine practice," he told CNNMoney. "It's only under pressure that they will release some exceptional figures like the total appropriation." "It doesn't make a lot of sense," Aftergood added, because in most cases, cost figures would not betray national security secrets. Outsourcing to former CIA employees: The report reveals that two psychologists formed a company "specifically for the purpose of conducting their work with the CIA." The company was paid at least $81 million and had a nearly-exclusive contract for staffing the facilities. Shortly after the company was founded, "the CIA outsourced virtually all aspects of the program." Many employees were former CIA employees. The company provided both interrogators and psychologists. According to the Senate report, an inspector general review noted "concerns about conflict of interest" because of how the contractor was paid. The company would assess the mental state of detainees. It would then collect extra money if its own interrogators were cleared to use "enhanced interrogation techniques." Those interrogators were paid $1,800 a day, "or four times that of interrogators who could not use the technique." In addition, the CIA agreed to cover the company's legal liabilities related to the program, and has so far paid out more than $1.1 million. The CIA is also required to pay the company's legal expenses "through 2021."